In Phrao, the disabled and elderly cannot get to public health programs or services. They have Warm Heart’s Project Access. Project Access serves those most in need, those without family, friends or funds, those with overwhelming care needs who cannot care for themselves. Warm Heart’s Public Health program, Project Access, provides the people of Phrao with support and resources critical to their health and well-being. Project Access provides everything necessary to keep life enjoyable and worth living for the isolated disabled and elderly – car rides to the hospital, art therapy sessions, bedside gardens, clean sheets, music, conversation and much more. 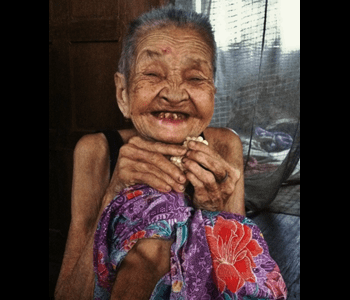 Many in Phrao, especially the growing population of the disabled and elderly, live in sub-standard conditions due to poverty and their location in rural Northern Thailand. Warm Heart, in many cases, is the primary link between community members and the government health services that lack the resources to serve a widely dispersed population. Volunteers survey the community to find members in need and come up with the best way to help them. This is Kangao, age 86. She is blind and hard of hearing, but that doesn’t keep her from laughing and smiling. She receives a monthly pension of $25.00 from the government, but this doesn’t begin to cover her expenses. We visit her weekly to clean her home, cook her nutritious meals, take her to the hospital and, most important, make her laugh a lot! Kangao is just one of many that our visiting teams led by Noina, a professional nurse’s assistant, visit on a regular basis, bringing smiles and laughter, brooms, mops and cooking pots. Each morning Noina gathers her team of volunteers and packs our old Suzuki with healthy snacks, cleaning supplies, games and newspapers. Off they go bouncing and splashing along muddy country roads to make their rounds. They give the frail a gentle bath and get them into the sun. They take folks to the market to schmooze or to the clinic for an appointment. Noina and her team make upward towards 1,100 visits annually. They are the lifeline for three dozen shut-ins’, their safety net. Their visits are the one joyous hour in otherwise drab and lonely weeks. And when there’s an emergency at 3:00 AM, the Warm Heart truck is there for a trip to the hospital. 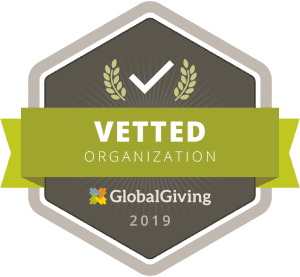 By coordinating and providing seed funding for community efforts, Warm Heart also helps renovate, rebuild, and provide wheelchair access to improve living conditions for the very poor. Warm Heart was contacted by a local benefactor who lives in Phrao in January. He asked to donate to an elderly woman (75 years old) of Santisuk Village, Mae Pung Sub-district. She does not have many immediate relatives that she can rely on, nor does she have any surviving children. Due to her age, it is now very difficult for her to walk. Her living conditions make it even more difficult for her to do simple tasks like go to the bathroom or cook for herself. In the past she has been given the opportunity to live elsewhere, but Grandma wanted to stay her home. She was born in the house and has lived there all her life. For that reason, Warm Heart wanted to make it possible for her to live comfortably in that home. The renovations included reconstructing the roof, cement walkways, and bathroom. In December 2015, a group of high school students from New Zealand came to build the first construction project. 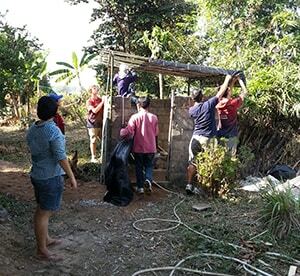 The group had raised money back home to fund the project and to help support a husband and wife in their sixties from Pa’Siew Village, Phrao Sub-district. The couple has very little income due to their physical disabilities. 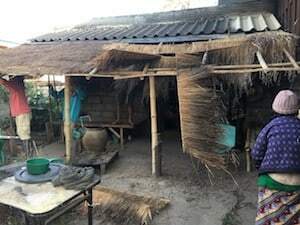 The husband weaves and sells baskets, which provided them with approximately 800 Baht per month ($25) — hardly enough to sustain them. The project included constructing a concrete pathway to provide the man with a safe surface to use his wheelchair. Overall, the house was in very poor condition. The volunteers were determined to make it better in every way possible for the elderly couple. After 4 days of hard labor, the concrete pathway was built and a concrete wall was raised to section off the bathroom from the house. The couple was very grateful for all the hard work and the donation that was made to them. We were contacted by locals to help a loved member of the Chiang Am village (Village 9 of Mae Waen sub-district). The man is disabled and quite poor. His original home provided very little shelter and greatly reduced his quality of life. He lived in a one-room straw hut without a proper kitchen and with no toilet. Public Health Project Access Volunteer, Tuff Witarama, visited the man and his home to see what needed to be done. 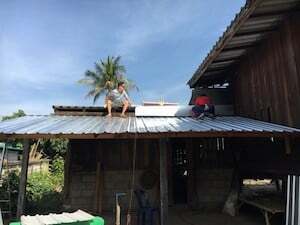 He quickly realized the home needed to be entirely rebuilt and thus decided to begin raising money to support the project. He raised 15,000 baht on behalf of Warm Heart in a matter of only one week. Another Warm Heart staff, P’Tai, also helped organize the construction. She reached out to an NGO who she felt would be interested in lending a hand. 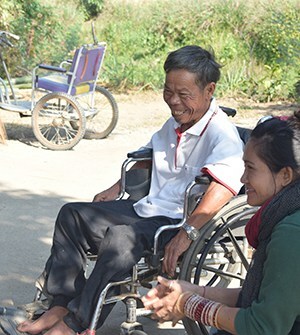 The Foundation for the Disabled in Chiang Mai matched Warm Heart’s donation and provided materials for the man to begin his new life including a bed, clothes, and toiletries. 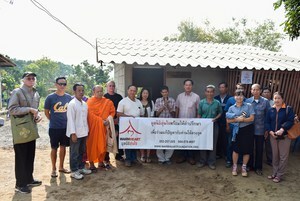 Local leader, Nai’yok Intorn of Mae Wan coordinated the help from villagers to rebuild the home. They spent a full four hard-working days to complete the home. The man was incredibly grateful and happy to have a proper, clean space to live. On February 18, Warm Heart helped welcome the man into his new home during the house blessing. Our Public Health program covers many needs for the disabled and elderly who live in poverty in Phrao. 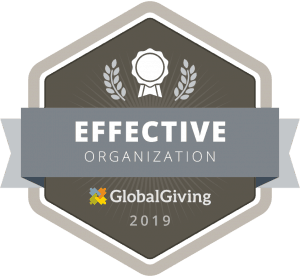 Donations to support our program are always needed. Please Donate!